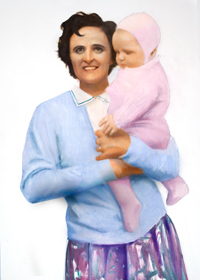 One of thirteen children, Gianna Beretta was born in the small Italian town of Magenta on October 4, 1922. Raised by devout Catholic parents, Gianna was taught that life is a gift from God and should be used for the good of mankind. As a result, Gianna, and her siblings who survived into adulthood, chose professions in which they could serve God and provide benefit to the world, such as the priesthood, religious life, engineering, and medicine. Medicine was Gianna’s chosen field. After graduation from the University of Pavia in 1949 with degrees in medicine and surgery, Gianna opened a clinic near her hometown where she specialized in care for mothers, babies, elderly people, and the poor. Her love of children led her to the University of Milan for a specialization in pediatrics in 1952. Gianna was certainly not a stereotypical saint. She loved to ski and to hike in the mountains. But, throughout her life, she was a daily communicant and, as a young girl, she became active in the St. Vincent de Paul Society and worked among the poor. Later, as a doctor, she offered her time to Catholic Action and not only took no money from the poor that she treated, but often gave them money for medicine or food. In 1955, Gianna married Pietro Molla and, in November 1956, became the mother of Pierluigi. Over the next three years Gianna and Pietro had two more babies, girls named Mariolina and Laura. Though a professional, Gianna was also very much a loving mother who was able to balance the demands of her career and her growing family. In September 1961, Gianna, pregnant with her fourth baby, was found to have a uterine tumor. A hysterectomy, a relatively uncomplicated operation, could correct the problem, but at the cost of the fetus and any future children. A second option was to have an abortion, but this was morally offensive to Gianna. Another, but more complex and higher risk operation was to have the tumor removed while making every effort to save the baby. This was the choice that Gianna made. Before the operation, Gianna insisted that nothing was to be done to endanger the life of the baby. She wrote, “I trust in God, yes; but now it is up to me to fulfill my duty as a mother. I renew to the Lord the offer of my life. I am ready for everything, to save my baby." The operation was successful. On April 20th, 1962, Gianna entered the hospital to give birth to her fourth child. She told her husband, "If you must decide between me and the child, do not hesitate: choose the child--I insist on it. Save the baby." Gianna Emanuela was born on April 21st. In giving birth to her daughter, Gianna contracted an infection which led to her death one week later on April 28th. Gianna Molla was beatified by Pope John Paul II on April 24, 1994 and canonized by him on May 16th 2004. Her family and many friends attended these ceremonies. She has been called the Pro-Life Saint. Her life is celebrated by a memorial on April 28. Gianna Molla's message today: In an age when a more casual attitude is taken by many toward the lives of the unborn, we should look back at Gianna Molla’s choice, a choice similar to that made by Jesus on the cross when he died for us. What can you do to influence a family member or friend to respect all human life?